Lyres are known from archaeological remains and works of art from ancient Mesopotamia and Egypt and are still in use today after some 5,000 years. The lyre illustrated at the top of the opposite page is a copy of one found in a Frankish grave of around 700 A.D. and represents the North European lyre. Similar lyres were used in Britain until the 12th century or so. 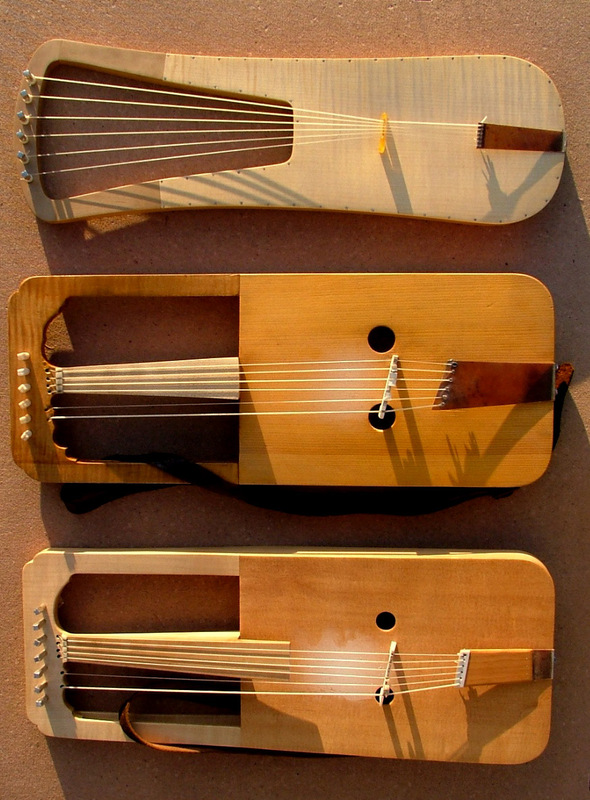 Lyres were the only important stringed instruments in Britain and indeed North Western Europe until the advent of the triangular harp at around the 8th century. The bow was applied to stringed instruments in Britain at around the 11th century. A 6th century British poet, like Aneirin, probably accompanied himself on the lyre. Venantius Fortunatus, Aneirin’s continental contemporary, wrote these lines in an elegy. Barbarus harpa, chrotta Britanna canat. The Roman praises thee on the lyra, The Greek on the Achillean [lyre],The Barbarian [German] on the harpa, Britons sing [of thee] with the chrotta. The word chrotta is probably related the word crwth but refers to a plucked, or more probably, strummed lyre. Six-stringed lyres are known from archaeological finds from the period and five and six-stringed lyres are illustrated in manuscripts of the 8th and 9th centuries. In his De harmonica institutione, Hucbald of St. Amand (840-930) gives a lyre-tuning which, in modern note-names, would read, CDEFGA, and the two poems from Llyfr Aneirin (Disc I, Track 12. and 13.) are accompanied using this tuning. It is likely that other tunings were also used at that time, ancestors of the cyweiriau used in cerdd dant. This particular kind of lyre is shaped so that the left hand may be firmly wedged into the narrowest part of the frame, making a strap unnecessary. The right hand strums some or all the strings with a plectrum while the fingers and thumb of the left hand hold the strings, releasing them when they are required to speak clearly. If the strings are strummed while the fingers are resting on them they give a sharp, percussive sound. In the photograph, below the lyre, there are two crwths. The lyre is the ancestor of the crwth and they share a number of features: six strings which splay towards the yoke of the instrument, a tailpiece, a flat bridge (of amber in the lyre’s case), six tuning pins, a flat, hollowed-out body and the arms, which extend to reach the yoke, are hollowed out for lightness. Unlike the lyre, the crwth has a finger-board bisecting the frame, sound-holes, and the strings, after passing over the nut are led down tunnels to re-appear at the back of the instrument. The lyre has a hardwood sound-board nailed to the body but the crwth‘s softwood sound-board is glued on. One leg of the crwth’s bridge is much longer than the other and reaches through a sound-hole to rest on the inside of the instrument’s back. It acts a little like a sound-post. The crwth has a strap which goes round the player’s neck, freeing the arms from the weight of the instrument. The crwth is planted firmly on the breast-bone to be played. Though the crwth is played with a bow, the strings may be plucked using the thumb and fingers and bowed simultaneously (Track 10.). The bow may be viewed as a new kind of plectrum. Both crwths are copies of the Heyward Crwth, National Library of Wales, Aberystwyth, circa 1700. The lower crwth has an extra, purely symbolic tuning-pin, a feature described in a poem requesting a crwth.